Alfred Blalock | Adventures of a Funky Heart! These two men did pioneer work on blood loss and shock. They developed heart surgery procedures that are still in use. Odds are, you have only heard of one of them. Vivien Theodore Thomas was born on August 29, 1910 in Lake Providence, Louisiana. After graduating high school in 1929, he planned to attend Tennessee Agricultural and Industrial State Normal School, (Now known as Tennessee State University) with hopes of becoming a doctor. He had been in school two months when the stock market crashed, causing him to lose his part-time carpentry job. Forced to drop out of college, Thomas still found work as a Lab Assistant at Vanderbilt University Medical School, working for surgeon Dr. Alfred Blalock. Although hired to sweep floors and clean out cages, Vivien Thomas impressed Dr. Blalock with his intelligence. Blalock was so impressed that he trained Thomas to be his Surgical Technician. Thomas began assisting Blalock in the study of shock during surgery. Shock is caused by a sudden drop in blood flow through the body, and can be fatal. Working together, Blalock and Thomas developed ways to prevent shock from occurring during an operation. By World War II most of their theories were in use, saving the lives of countless injured soldiers. In 1941, Dr. Blalock was hired by Johns Hopkins Hospital in Baltimore, Maryland, to serve as the hospital’s Chief Surgeon and as a Surgical Professor in the Hopkins Medical School. The doctor asked his trusted assistant to go with him, and Thomas agreed. But while Blalock was responsible for training every surgeon in the school, Thomas had to enter the building through the service entrance. He was also listed on the hospital payroll as a handyman. The two men respected and trusted each other, but were hardly equal. At one time, Blalock was paid ten times more than Thomas. 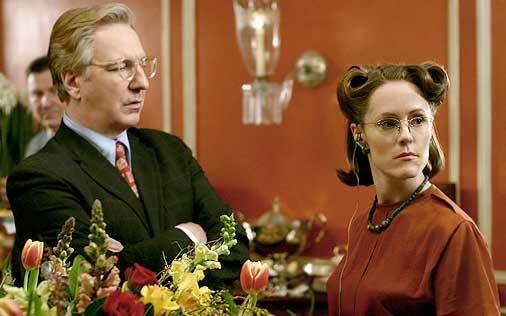 Often the doctor hired Thomas to serve drinks in his home during a social event. And never was Thomas allowed in the Operating Room. It was at Johns Hopkins that the two men met Dr. Helen Taussig. Taussig had been hired in 1930 to oversee the Cardiac Clinic of the Harriet Lane Home, (Hopkins’ children’s hospital) and quickly grew interested in “Blue-Baby” diseases. 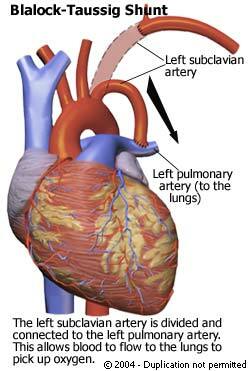 Usually, blood coming into the heart is routed first to the lungs, where it absorbs oxygen. The oxygen rich blood then goes back to the heart, where it is pumped throughout the body. Blue Babies are born with a badly formed heart or blood vessels that cannot provide enough oxygen to the blood. Their skin has a distinctive blueish tinge, especially in the fingertips. At that time Blue Baby diseases were incurable, and almost all of the patients died very young. Dr. Taussig approached Dr. Blalock with an idea: if a Blue Baby’s heart couldn’t provide oxygen to the blood naturally , then why couldn’t a surgeon re-route the major blood vessels? Taussig’s plan was interesting but extremely dangerous. The operation would have to take place near the heart, and heart surgery was so risky it was almost never recommended. Any accidental damage to the heart would have to be repaired within 4 minutes, or the patient died. Busy with his teaching duties, Blalock asked Vivien Thomas to work out the details of how such an operation could be done. Thomas began by studying medical textbooks, drawings and diagrams of hearts, and even real hearts taken from dead bodies. Then he operated on dogs, intentionally creating Blue Baby hearts in them. Later he would operate again, repairing the heart and making careful notes of everything he did. It was a slow process, learning exactly what had to be done. Many dogs died, and several of the surgical tools he needed didn’t even exist. Quite often, Thomas would invent them. X-rays of the patient were another problem. X-ray films provide a good still photograph of the workings of the body. But Taussig preferred to use a fluoroscope. A fluoroscope image is best described as “X-ray TV”– It provided moving images of the interior of the body. If the patient accidentally moved, so did the picture. There was no way to record the fluoroscope image, so the three doctors would have to study their patient’s fluoroscope scans carefully and commit them to memory. At last they felt they were ready, and Taussig began to search for a proper patient. On November 29, 1944, they operated on a little girl named Eileen. Although fifteen months old, Eileen only weighed nine pounds. Thomas had planned to be in the observation room, watching the operation. Blalock said no – he felt more comfortable with Thomas close enough to give him advice. In preparation for the operation, Thomas had performed the procedure over 100 times on animals. Blalock had been taught the procedure by Thomas, but had actually done it only once. Breaking all the rules of the time, Thomas entered the operating room and guided Blalock through the operation. Proven to be a success, Blalock’s team performed nearly 300 operations in less than a year. Surgeons came from around the world to study Blalock’s new surgical procedures, only to learn that Thomas was the expert, not Blalock or Taussig. Still, the operation was known as the “Blalock-Taussig Shunt,” named for the surgeon who performed it and the doctor who suggested it. Blalock retired in 1964 and died four months later. For six years, Thomas continued to teach but took on no major project – almost as if he were in mourning. But as the 1970’s began, more and more African-Americans were entering the Hopkins Medical School. To them, Vivien Thomas was not just one of their teachers, he became their mentor. And just as he had guided Blalock so many years before, Thomas’ advice and support guided a new generation of doctors through medical school. 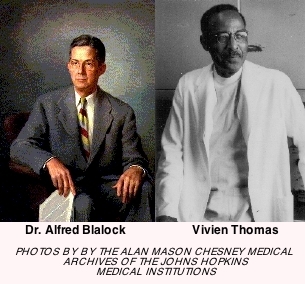 * Thomas’ autobiography has been reissued with a new title: Partners of the Heart: Vivien Thomas and his work with Alfred Blalock. A hardback copy of the original title, Pioneering Research in Surgical Shock and Cardiovascular Surgery: Vivien Thomas and his work with Alfred Blalock is usually valued at over $100. ** This photo has been identified by Johns Hopkins archivists as being a photo of the third Blalock-Taussig Shunt taken in early 1945. Dr. Helen Taussig normally would have been in the operating room but is not identifable in this photograph. Saturday (November 29) is the 64th anniversary of the Blalock-Taussig Shunt. It’s our birthday, and I think we should celebrate. Because the Blalock-Taussig operation was the first surgery designed to relieve the effects of a Congenital Heart Defect. Without Dr. Blalock and Dr. Taussig, there is no heart surgery. And without heart surgery… we aren’t here. So it doesn’t matter if you’ve never had the Blalock-Taussig Shunt; if you have a Congenital Heart Defect and have survived an operation, this is your event, too. To celebrate, I’m wearing Red and Blue on Saturday. I was blue (Cyanotic) and now I’m red… or at least, an acceptable shade of pink. Why don’t you do the same? Ask your friends to wear the colors, also. I’m also wearing my Adult Congenital Heart Association (ACHA) pin. If you are a member of a CHD support group, make sure you put yours on, too. I’ll lose my ACHA lapel pin in a moment, so I usually leave it attached to my suit jacket; but I’m wearing it Saturday. Wear yours. If you have an extra pin, give it to someone you care about, or who cares about you. Call every Heart Dad and Heart Mom you know, along with fellow Heart Warriors and get them involved. Let them know what you are doing and why – and tell them to pass the word. 1 in 125 people have a heart defect, let the world know how many of us that there really are! A Congenital Heart Defect is an “unseen disability” – the general public will never know what we put up with. Instead of whining and complaining, we just want to do the best we can and be happy and productive citizens. We usually don’t draw attention to ourselves… but on Saturday, we need to brag a little! First, a quick update on two of our friends: Colby is home! As it says on his blog, he went before the Doctor’s Parole Board and they released him on good behavior. As of this writing Katie is still scheduled for a Glenn Shunt tomorrow. Keep this young lady in your thoughts. Surgical notes are very detailed, as operations have become more and more complex the level of detail in the notes has increased. Alfred Blalock’s notes on the first Blalock-Taussig Shunt are an incredibly short two pages. (Page One, Page Two) In surgical notes being written today, you may read a page and a half before the first incision is made. If you had your surgery a long time ago, you will have to contact the hospital where the surgery occurred and request the notes. Be prepared for a wait. You will have to fill out a form to release the records (even though they are your records)… the HIPAA laws require it. And then… be patient. Your records may be stored somewhere away from the hospital, and someone’s got to dig them out. That might take a while. You really need a copy of all your surgical notes, if you can get them. Surgery is like Chess – everything starts from the same point, and there are a limited number of opening moves. All Bi-directional Glenn Shunts, for example, start the same way. Surgeons are the Grandmasters; they have the ability to think three steps (or more) ahead and they know when it’s time to deviate from the accepted course. You can’t learn this skill by reading a book, it only comes with training, repetition, and an inborn skill. They just know what they need to do next, how it is going to affect the body, and how to react if a crisis develops. Every surgery is different, because your surgeon is reacting to what he finds inside of you. So even though we may share the same defect and the same surgical procedures, our insides may be totally different. So get those surgical records, having them could save your life! Wait a minute, that doesn’t rhyme. I guess my career as a songwriter isn’t going anywhere. I’m packed for the trip to Atlanta, the laptop is also packed and the batteries are charged, so I should be able to post tomorrow night. Of course, you’ll get a full report once I return home. I’m feeling good and not expecting any problems, though my weight is up a little bit. So the doc may wave his finger in my face. He won’t have to crack the whip too hard; I don’t like for it to be up either. When you have heart failure, your weight creeping up might mean there is a problem brewing. And even if it doesn’t, your heart has to work harder. That’s not good. First, here are a couple of links that you need to read: Researchers have discovered that a new type of drug can trigger a heart defect in unborn mice. The chemical in question is fairly common, so if you are planning to have children (or more children), clicking these links would be beneficial! But let’s not get ahead of ourselves; the sky isn’t falling (yet). Taking the results of a research study using unborn mice and saying that we’ve found a way to prevent heart defects is a giant leap, but it is certainly worth continued study. Is animal research necessary? I have to answer with a resounding “YES!” When he was designing the first congenital heart surgery, Vivien Thomas first had to study the effects of Tetralogy of Fallot (ToF) in a test subject, then figure out a way to correct the defect. Conducting experimental surgery on children with ToF was completely out of the question, so Thomas first had to surgically re-create the defect, then devise a corrective procedure to counter it. His test subjects were dogs, most of them supplied by the Baltimore City Pound. Thomas is said to have performed heart surgery 200 times or more before Alfred Blalock attempted it on a child, so we must assume that most of those operations were failures. The dogs almost certainly perished. Finally Thomas figured it out, and not only did the dog (a “mutt” named Anna) survive the procedure that “gave” her a defective heart, she made it through the operation that corrected it. Thomas then taught Blalock the operation (again, on a canine test subject) and on November 29, 1944, with Thomas standing behind him giving him guidence and advice, Blalock performed the first operation designed to relieve a Congenital Heart Defect. (Click this link for a “Who’s Who” in the operating room!) The operation eventually became known as the Blalock-Taussig Shunt. Anna became the mascot of the Johns Hopkins Surgical Lab and lived there until her death in 1957. She even had her portrait hung in the Hospital. While animal research may be necessary; animal cruelty is not. My personal rule of thumb is “Would I do this to my family pet?” If the answer is no, then that test is not done. (And this standard can be subjective; my dog is not my pet, she is a member of the family. A neighbor who owns hunting dogs does not think of them as his pets, rather they are “tools”. Their main purpose is to do a job: Tracking deer.) So even going by my own rule, Thomas would have never invented cardiac surgery. Because I couldn’t do that to my dog. So now, all I’ve done is muddied the water! While you are contemplating the fine line between animal research and animal cruelety, carry a couple of doggie biscuts in your pocket and be sure to toss one to a stray. Because if it wasn’t for a mutt named Anna, none of us with a heart defect would be here.